Providing some much needed closure for the mission team. In May 2015, the European Space Agency lost all contact with its Rosetta mission’s lander, Philae. Now, less than a month before the mission of comet-orbiter Rosetta was set to end, its high resolution camera manages to capture an image that shows Philae’s final resting place wasn’t going to remain a celestial mystery. Philae was meant to land on a comet called 67P/Churyumov-Gerasimenko. The challenging task was (nearly) pulled off in November 2014. Unfortunately, upon landing, the lander bounced twice and landed in a shadow. Unable to get enough sunlight to charge its solar panels, Philae went through its power supply within 57 hours and fell silent—resulting in the Rosetta team losing contact with the lander altogether. Still, as the comet approached the sun six months later, Philae managed to gather enough power to signal home with a few inconsequential blips. Nothing was from heard from it since. On September 2, 2016, Rosetta took images of the comet from a distance of 2.7 kilometers (1.67 miles) from its surface. Upon closer inspection of the photographs, the three-legged probe was finally spotted. 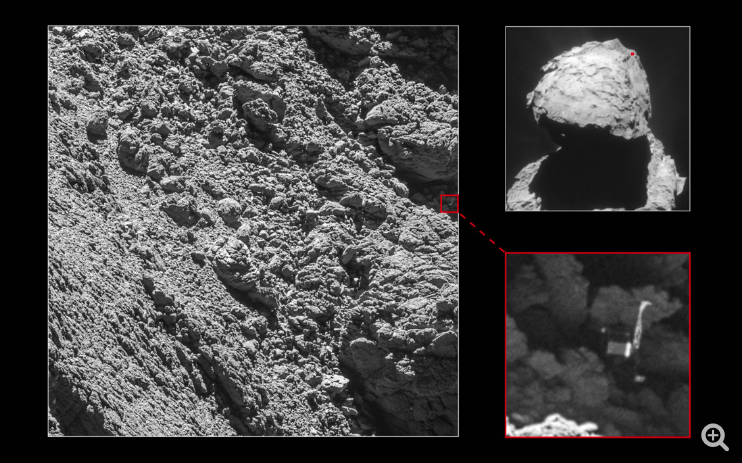 In the image, Philae was seen wedged into a crack on the surface of the comet. While spotting the lander isn’t going to put it back in commission, the find can help researchers decipher the images it was able to transmit before shutting down. Also, let’s not forget the sense of closure researchers can feel now knowing Philae’s final resting place.